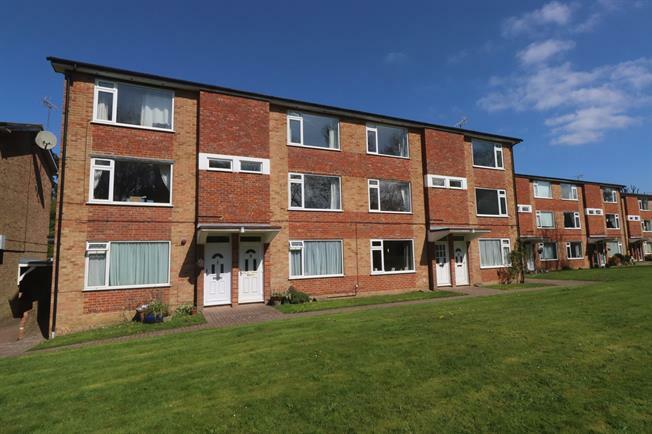 2 Bedroom Maisonette For Sale in Caterham for Asking Price £285,000. A spacious, split level, purpose built maisonette situated on the edge of town close to miles of open countryside. The property is in need of updating including the wiring, heating systems and redecoration throughout and has been priced to reflect this. The property enjoys an open, southerly outlook over the extensive and well cared for communal grounds and countryside beyond. The flat features two double bedrooms and a 25' double aspect, lounge diner as well as a basic kitchen and bathroom as well as double glazing. There is a single garage en-bloc & residents parking and the property benefits from a share of freehold. Double glazed front door. Stairs to first floor. Cupboard. A double aspect room overlooking the gardens and woods beyond to the front. Sliding door to kitchen. Lobby with stairs to the second floor. A rear aspect room in need of upgrading but with space for appliances. A front aspect double bedroom with built in wardrobes and over-stairs cupboard. Far reaching views towards the North Downs over the gardens. A rear aspect double bedroom. A good sized bathroom fitted with a coloured suite. Airing cupboard. There is a single garage en-bloc as well as resident's parking. The extensive grounds are a particular feature of Liskeard Lodge with well tended lawns with borders and mature trees and shrubs.